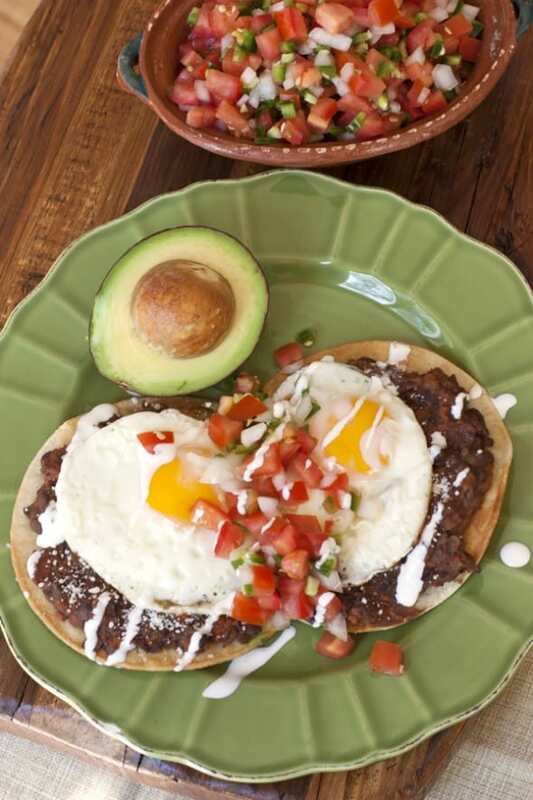 I could eat huevos rancheros for breakfast, lunch, or dinner. 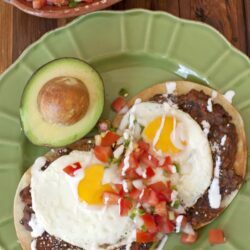 A classic Mexican breakfast, huevos rancheros are fried eggs served on lightly crisp corn tortillas smothered in beans or salsa. I have a thing for fried eggs and if no one is looking I will lick my plate. That’s how good this dish is. Ever since I was a little girl I always liked runny eggs. My grandma would ask me how I liked my eggs and I would say, “con una bolita” (with a little ball on top), because I never knew how to say sunny side up or over easy in Spanish and she knew exactly what I meant. This dish is considered a traditional Mexican peasant dish because more than likely you have all the ingredients on hand. I consider this dish the best kind of comfort food. 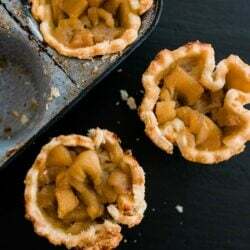 It’s a simple recipe and a family favorite on a weekend morning. 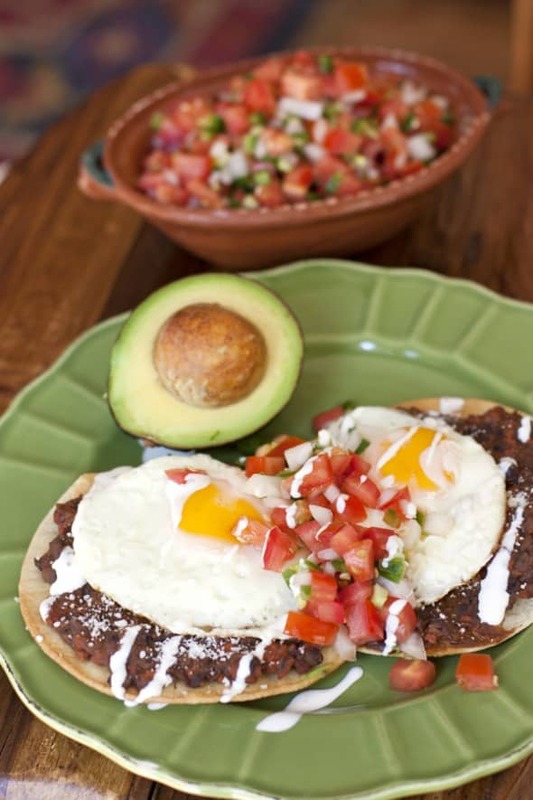 If you love huevos rancheros then also check out these smoky huevos rancheros. Speaking of comfort food I will be on the road again and missing home and home cooking, but thankfully I’ll be staying with friends and family so there will be some home cooking involved. California here I come! I love to reunite with friends and meet new ones. Vianney and I hope to see you at one of our Latin Twist book signings (see schedule below or here on my book tour page). September 26, 2:00 – 4:00 PM at Casa Artelexia in San Diego. Casa Artelexia is a cozy Mexican gift shop with handmade jewelry, art and more. Come join us for cocktails and bites. September 28, 6:00 – 7:30PM at Traveler’s Bookcase in Los Angeles. Traveler’s bookcase is all about travel and we are excited to sign books there. Come join us for a book signing and Latin cocktails. September 29 at Melissa’s Produce. This is a private media event (not open to the public). Melissa’s Produce has supplied us with fresh produce for Latin Twist, blog posts, events, and videos. We are so excited to meet the team in person and thank them for their support and helping make Latin Twist possible. In a heavy skillet heat oil. Place tortillas carefully into hot oil, one at a time, and fry for 20 to 40 seconds on each side or until lightly crisp and golden. Drain on paper towels. Crumble the chorizo into a cast-iron skillet and cook the chorizo over medium heat for 10 minutes. Add the beans and cook for five minutes. Using a potato masher, combine the chorizo and beans together. To assemble, place a tostada (fried tortilla) on a serving plate; spoon on some refried beans. 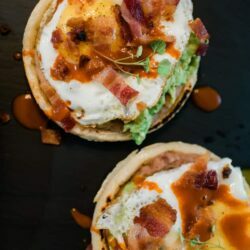 Sprinkle with cotija cheese, and top with a fried egg, pico de gallo, and drizzle with crema Mexicana. This look so good I do not like black beans in any recipes so will pinto beans work. Also can I use pinto beans in all Mexican recipes that use black beans? Thank you Maria. Absolutely! Pinto beans will work with this recipe too. Its really what you have on hand that make this dish special. Enjoy! I love eggs. I could eat them all day, everyday. As a matter of fact, I had scrambled eggs with maduros for dinner last night and then again, but hard boiled for breakfast this morning. I’ve never had huevos rancheros. That is something I must put on the list. I have to confess though, that eggs and beans is a combination that scares me a bit. But, this recipe looks so good that I must try it. Wow, you certainly have been busy! How exciting that you are sharing your book with so many people. My book club enjoyed your sangria recipe last month. It disappeared quickly!